I was told to smile more, mostly by strangers. At a very young age, I remember white-haired men grinning and asking me—rather, telling me—“Smile, young lady!” Those demands usually resulted in my smirking, half-smiles, or the opposite. I suppose I didn’t look as pretty without a smile, and perhaps I owed it to the world to beautify it. I was not a miserable child. I wasn’t experiencing terrible tragedies in my early youth. I just didn’t smile a lot. I was like those people in sepia portraits from the 19th century: the ones who don’t realize their expressions might make others uncomfortable. Exhortations to be noticeably happy intensified when I became a flamenca: Why do you always make that face when you dance? Why so angry? Why don’t you smile more? When I was fifteen years old I discovered the art form of flamenco. It became a home far away from my own in the Sonoran Desert. 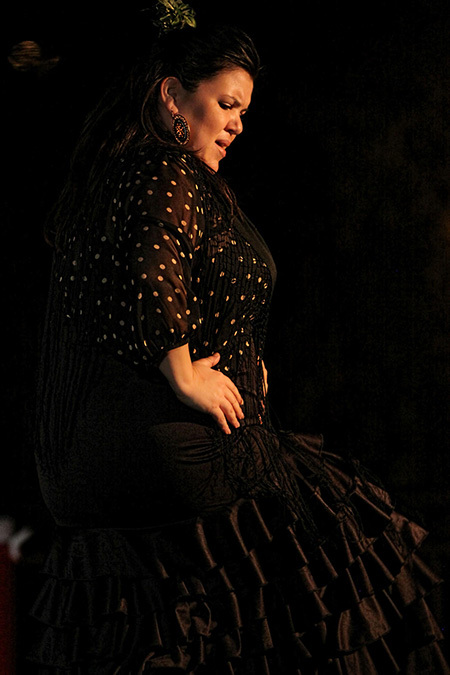 Flamenco comes from Andalucía, the Iberian borderland between Europe and Africa. It is a gathering of cultures at the Mediterranean—mixed, vibrant, ancient. It is a place of movement, a crossroads. Many music traditions have influenced what we today call flamenco. For me, flamenco is not only about origins, but also about destinations. Multiple generations have made flamenco art in their homes far away from Spain. Cultures and peoples as far away as Israel, Japan, Argentina, Mexico, Canada, and of course, our desert Southwest, live out a small piece of the flamenco world today. More like a message than a language, flamenco has spread widely. But like any foreign language, understanding is kept at arm’s length. It is a complex art form, difficult to explain with words. Sometimes audience members come up to me after I perform and ask: Where did you get your dress? What story were you telling with your hands? What was the singer saying? Are you from Spain? Where do you get so much energy? What kind of shoes are those? What were you yelling at each other? Why doesn’t everyone smile more? I share the basics of flamenco with my students, but even in the studio these questions can be tough to answer. Flamenco is difficult to learn. Brave souls end up in a studio or a private music lesson trying to figure out what flamenco is all about. But it is hard to be born all over again, to learn how to walk again, to learn how to say something coherent with your arms, with your spine, and to make new sounds in a rhythm you never heard in the womb. Flamencos often communicate nonverbally. The trust between compañeros is a lifelong lesson. The cuadro, the flamenco group, acts like a lifeline of support to each other in art making, cooperating like kin. This communication is rarely simple. But there is a reason why the enigma of flamenco has spread to the world. Not only Spaniards quit their jobs and turn their living rooms into rehearsal spaces or travel thousands of miles to sit in a front row seat. I’ve cried countless times watching a flamenco artist improvise his or her way into shared majestic ecstasy on a tiny stage. I’ve seen old men who could hardly walk mesmerize audiences with their footwork. I’ve heard circles of men and women embracing each other with the sound of their voices and strings. Little children have sung out poetry that carries a weight one hundred years old. Mothers and grandmothers open their chests and whip up dust like a fever. In the dance studio and on stage, I’ve felt lifted off the ground too, like someone was cradling me, swaying me back and forth. I can’t recall all of the tragic, magic, gorgeous flamenco moments I’ve seen for the past twenty-five years. And it is hard for me to believe I’ve made some of those moments myself, with my own body. Mine is an unlikely dancer’s body. But it has managed to make people cry too, with very few questions after the show. Fewer smiles. How do I explain flamenco? I usually employ rickety figurative language. Flamenco is like family, I say. Or, Flamenco is like a vampire. Or even, Flamenco is an old, overweight, beautiful Elvis in rhinestones. Metaphors help, but flamenco gets lost in translation. Flamenco is a constant mystery that even its most intimate players can’t quite define. It is meant to be that. Not every question has an answer. Flamenco is also a gift. That much I know. With each passing year of practice, and after I’m too old to move gracefully, it will continue to bring me something much greater than happiness. 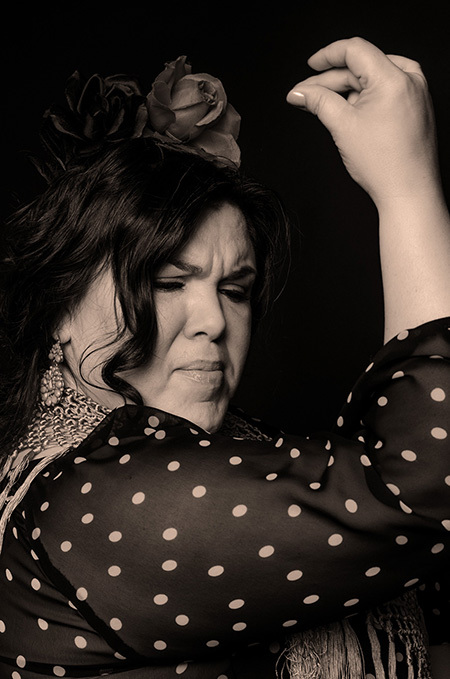 Mele Martinez performs with other Arizona flamenco artists at the first annual TMY After Hours, Sunday, Oct. 15, 6:30-9pm at Exo, 403 N. 6th Ave., Tucson. Unfortunately, the event is sold out.